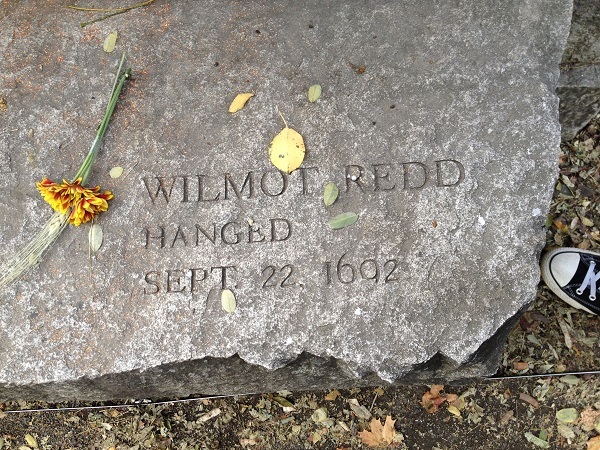 Wilmot Redd (also known as Wilmot Read and Wilmot Reed) was a woman from Marblehead who was accused of witchcraft during the Salem Witch Trials. Redd was the only person from Marblehead who was tried in the Salem Witch Trials. Wilmot Redd was married to a fisherman named Samuel Redd and lived in Marblehead in a small house next to Old Burial Hill at the southeast corner of what is now called Redd’s Pond. It is not known if the couple had any children or extended family. “At this time there lived in Marblehead an old woman, the wife of a fisherman, of whose supernatural powers many weird and dreadful stories had been told. ‘Mammy Redd’ was considered a witch, and had been known to afflict those whom she disliked in various ways. To some she sent sickness and distress by wishing that a ‘bloody cleaver’ might be found on the cradles of their infant children; and it was said that whenever the wish was uttered the ‘cleaver’ was distinctly seen, and the children sickened and died. At other times, it was said, she caused the milk to curdle in the milkpail as soon as it had left the cow; and numerous instances were cited to prove that she had often caused the butter churned by her enemies to turn to ‘blue wool.’ In spite of the grievous manner in which they believed themselves afflicted, the kind-hearted people of Marblehead had made no complaint to the authorities of the matter, and it was reserved for several deluded young women of Salem, who had already caused much suffering in that community by their ready accusations, to cause her arrest and imprisonment.” (Roads 31). On May 26, 1692, the afflicted girls, Ann Putnam Jr, Mary Walcott and Mercy Lewis, complained of being afflicted by Wilmot Redd. On May 28, Joseph Houlton and John Walcott filed complaints against several people, including Wilmot Redd, Martha Carrier, Elizabeth Fosdick, Sarah Rice, Elizabeth Howe, John Alden Jr, William Proctor, John Flood, Mary Toothaker and her daughter, and Arthur Abbott. As a result, an arrest warrant for Wilmot Redd was issued that same day and she was apprehended by the Marblehead Constable James Smith. On May 31, Redd was brought to Ingersoll’s Tavern in Salem Village for her examination. When Redd entered the courtroom, the afflicted girls, Mercy Lewis, Mary Walcott and Abigail Williams, immediately fell into convulsions and began accusing her of pinching and hurting them and trying to force them to touch the Devil’s book. When the girls, as well as another afflicted person, John Indian, were each ordered to approach Redd so she could administer the “touch test” they collapsed to the ground and had to be carried over to Redd for the test, after which they recovered. “This examinant being often urged what she thought these persons ailed would reply, I cannot tell. Then being asked if she did not think they were bewitched: she answered I cannot tell and being urged for her opinion in the case all she would say was: my opinion is they are in a sad condition” (SWP No. 114.4). After the examination was over, Redd was indicted on two charges of witchcraft, one for afflicting Elizabeth Booth and one for afflicting Elizabeth Hubbard, and was taken back to jail. On September 13, a summons was issued for witnesses to testify in Wilmot Redd’s trial, which was scheduled to take place the following day on the 14th. It appears from the court records that only a few witnesses even showed up the next day, since John Caley and Ellis Henly were at sea and Benjamin Gale was too ill to attend, although it’s possible that more witnesses appeared but the records were later lost. Besides the afflicted girls, the only other witnesses who appear to have testified in Redd’s trial were Charity Pittman, Sarah Dodd and Ambrose Gale. Charity Pittman testified that five years ago Mrs. Syms lost some linen and suspected that Redd’s servant, Martha Lawrence, had stolen it. Pittman said she accompanied Symons to Redd’s and when Symons told Redd she would go to Judge Hathorne and get a warrant for Lawrence if she didn’t return the linen, Redd stated that she “wished that she might never mingere [urinate], nor cacare [defecate]” again if she didn’t leave and that shortly after Symons became ill with “distemper of the dry bellyache” which continued for many months (SWP No. 114.10). Sarah Dodd testified that she too witnessed this conversation and confirmed that shortly after it took place Syms became ill.
Ambrose Gale also testified and confirmed that shortly after this conversation took place, Syms became afflicted. Mary Walcott testified that she had been afflicted for a considerable time by a woman who said her name was Redd and that she lived in Marblehead and when she saw Wilmott Redd at her examination on May 31 she knew it was her. Walcott said Redd continued to afflict her and the other girls during the examination and stated “I believe in my heart that Wilmott Redd is a witch” (SWP No. 114.6). Mary Warren testified that although Redd never afflicted her, she saw Redd’s specter afflict the other girls during Redd’s examination and that she also “verily believe in my heart that Wilmott Redd is a witch” (SWP No. 114.7). In addition, Ann Putnam Jr also testified that a woman named Redd who said she was from Marblehead had been afflicting her for a long time and she realized that it was the same woman when she saw Redd at her examination. Putnam too said Redd continued to afflict her and the others girls at the examination by striking and choking her whenever Redd looked at her and that she too “very believe that Wilmott Redd is a witch.” (SWP No. 114.8). On September 17, after hearing all of the testimony for Redd’s case, the jury found Wilmot Redd guilty of witchcraft and sentenced her to death. 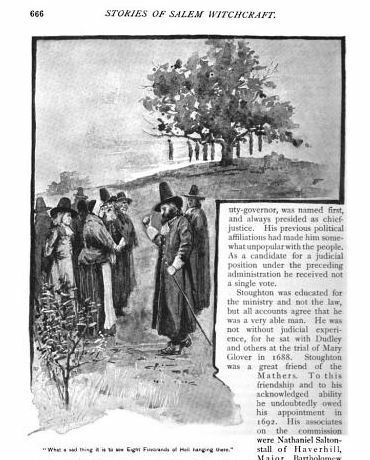 On Thursday, September 22, 1692, Wilmot Redd was brought to the execution site at Proctor’s Ledge in Salem, along with Mary Easty, Martha Corey, Ann Pudeator, Margaret Scott, Alice Parker, Mary Parker and Samuel Wardwell. When the cart carrying the prisoners started to approach Proctor’s Ledge, its wheels suddenly became stuck as it began to make its way up the hill. “The cart, going to the hill with these eight to execution, was for some time at a set; the afflicted and others said, that the devil hindered it, & c” (Calef 218). Eventually, the cart was freed and the prisoners arrived at Proctor’s Ledge. At the execution, the prisoners continued to declare their innocence when speaking their last words. They were executed and as their bodies were still hanging, the clergyman who had officiated at the hangings that day, Reverend Nicholas Noyes, remarked “what a sad thing it is to see eight firebrands of hell hanging there” (Calef 221). These were the last executions of the Salem Witch Trials. After the victims were cut down, they were temporarily placed in a nearby rocky crevice but it is not known what happened to their bodies after that. In September of 1710, a committee was sent to Salem to look into how to make restitution to the victims of the trials after a number of the surviving accused had filed petitions with the court asking that their names be cleared. For reasons unknown, none of Wilmot Redd’s relatives filed a petition with the committee. “Mr. Sewall Sir I thought good to return you the names of several persons that were condemned & executed that not any person or relations appeared in the behalf of for the taking of the attainder or for other expenses. they I suppose were returned to the General Courts consideration for to act about according to their best prudence. Bridget Bishop alias Oliver, Susanna Martin, Alice Parker, Ann Pudeator, Wilmot Read, Margaret Scott. Sir. I am yours Honors to serve Neh Jewet” (SWP No. 173.44). Nothing came from Jewett’s letter though because on October 17, 1711, the Massachusetts Legislature passed a bill clearing the names of many of the accused, except for Wilmot Redd, Alice Parker, Bridget Bishop, Susannah Martin, Ann Pudeator and Margaret Scott. Due to the fact that the Redd family did not file a petition with the court, they were also not awarded any money in damages for Wilmot’s imprisonment and death. Finally, in August of 1957, the Massachusetts legislature publicly acknowledged its errors in the Salem Witch Trials and cleared the name of “One Ann Pudeator and certain other persons” yet still did not mention Wilmot Redd’s name. On October 31, 2001, the Massachusetts legislature amended the 1957 bill and officially exonerated five victims not named in either the 1711 bill or in the 1957 bill: Wilmot Redd, Bridget Bishop, Alice Parker, Susannah Martin and Margaret Scott. On the 300th anniversary of the Salem Witch Trials in 1992, the Salem Witch Trials Memorial was built in Salem, Mass and a marker was established for Wilmot Redd. 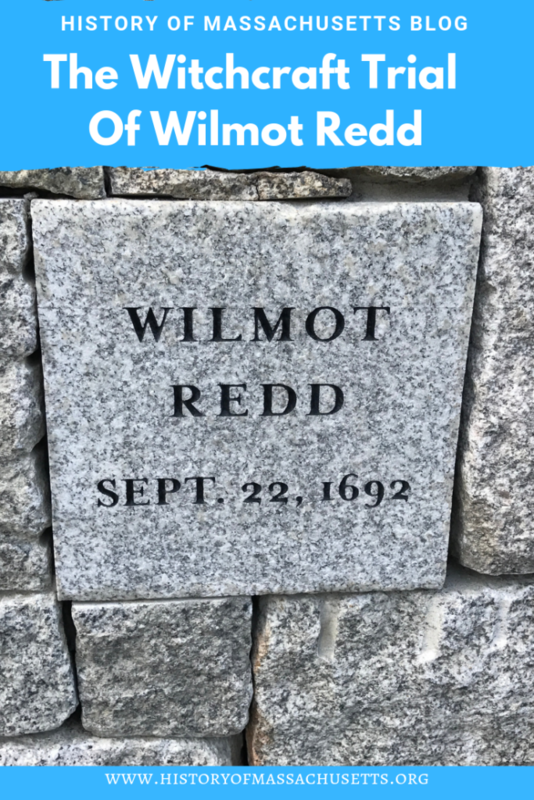 In 1998, the town of Marblehead placed a cenotaph for Wilmot Redd next to her husband’s grave at Old Burial Hill. 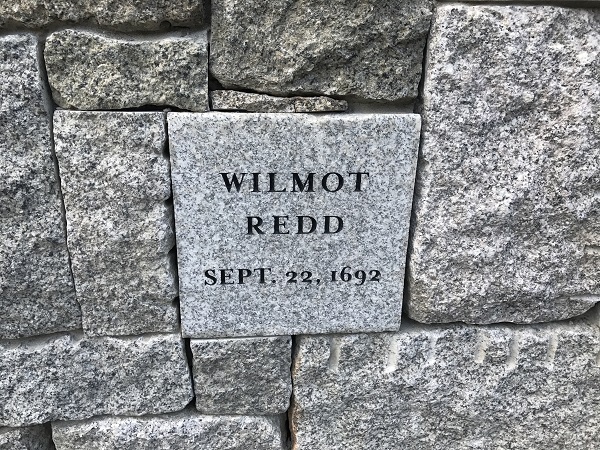 After the site of the Salem Witch Trials executions was discovered in 2016, the Proctor’s Ledge Memorial was built there the following year and a marker was established for Wilmot Redd. The location of Wilmot Redd’s grave has never been found. According to Sam Bultrusis in his book Wicked Salem: Exploring Lingering Lore and Legends, locals believe Redd still haunts Old Burial Hill and many have said you can sometimes hear the sounds of her cackling amongst the headstones. Local legend says that thrill seekers even recite a conjuring chant out loud near Redd’s pond to summon Redd’s ghost: “Old Mammy Redd of Marblehead, sweet milk could turn to mold in churn.” (Bultrsusis 80). Address: 17 Franklin Street, Marblehead, Mass. Private residence. No Admission. Address: 4 Federal Street, Salem, Mass. A large brick building now stands on the spot which has been renumbered 10 Federal Street. Memorial plaque located on the building. Roads, Samuel Jr. The History and Traditions of Marblehead. Boston: Houghton, Osgood and Company, 1880. Upham, Charles W. Salem Witchcraft: With An Account of Salem Village and a History of Opinions on Witchcraft and Kindred Subjects. Vol. II, Boston: Wiggin and Lunt, 1867. Calef, Robert. More Wonders of the Invisible World. Salem: Cushing and Appleton, 1823. Bultrusis, Sam. Wicked Salem: Exploring Lingering Lore and Legends. Globe Pequot, 2019.